Just got done with a lab report for electronics, now to finish prelab. These would be more fun if they weren't so cut and dry. But oh well, just another thing to get through right now. 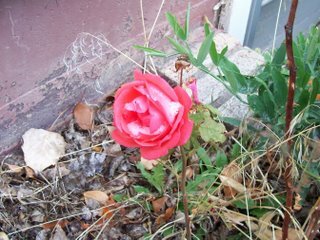 This is a rose that is still blooming, as of today, in front of my basement apartment. That is my window in the background. It is a little bright but the white spots are snow. The snow started falling early this morning, but as with all snow in Wyoming these days it really doesn't stick around for as long as it should. Enjoy the picture, now for me to do work, but you can continue enjoying. For some reason it is very hard to think right now. I really don't know what to write and, well... I don't know how to continue. I guess I am tired but I know how to deal with that. Classes are easy except one that I shouldn't even take my eyes off of for fear that it might destroy me. 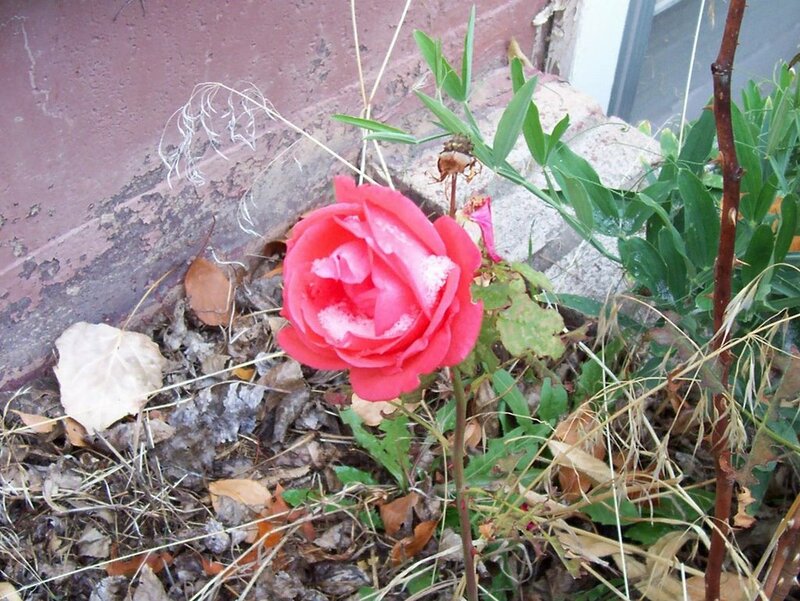 And well... here's another dead end in thinking, or at least writing. Let's just say that somedays are better than others in certain confusing situations. It is amazing how irrational the mind can be and once the analyzing kicks in it flings me to lower depths or greater heights. Fun. Or not. To not be confused is my goal, and in all instances that is what it is, but then (fingers dead on the keyboard) I am confused for no good reason. Do I just forget or what? It really isn't forgetting as much as analyzing a single point until that is all I am thinking about and not seeing the entire picture. This is not a very good strategy for nearly any application but this really isn't an application, just life. Now I see my flow is coming back, even if it doesn't make sense to anyone but me or the few people that I have talked to. I just... cliche statement, want to understand but I am afraid that I might not even if I drop everything that I am doing and try to figure it out en totale. Now to listen to some fun music while I try to do things other than type here, if the page loads. Finally, Cape Breton Live, good source of streaming celtic music, mostly Scottish I think. That's all for now.